Last month Jenny's Dodge Intrepid bit the dust (surprise, surprise) They have been looking for a good used Toyota Corolla, but they have either been snatched up or unsatisfactory. 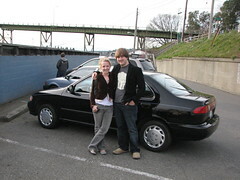 I found this '98 Nissan Sentra for them in Port Townsend. It is in very good shape and has 90,000 miles. Jenny will enjoy the power windows and keyless entry. Bjorn will enjoy the 5-speed transmission and 40+ mpg. So this weekend, Bjorn and Jenny came down to buy the car. Esther and Calvin went with them as I had play practice all day. After spending a week on the phone arranging a vehicle inspection and negotiating a price, I was subjected to endless abuse as a 'Dutchman' by the car dealer. Now they just hope the Rabbit stays together. hey You should try the latest key fob for Nissan. haven't you tried it yet?